Metal Gear Solid 4 has always felt a tiny bit incomplete. It's a game that offers a ton of hidden secrets and alternate paths, and leaves itself open to a big variety of gameplay styles. And yet there are no trophies to unlock for finding those secrets, or for playing the game in difficult, uncommon ways. Until now. We've known for a while that trophy support is coming to the 2008 classic, and today Sony Revealed the full Trophy list for the game. Some of them are pretty outstanding. Bronze You enjoy all the killing, that's why. Killed many enemies in one area, and vomited. Bronze Divine Wind Caused a "divine wind" using the Tanegashima. Bronze Hands Up! Held an enemy soldier at gunpoint and performed a body check. 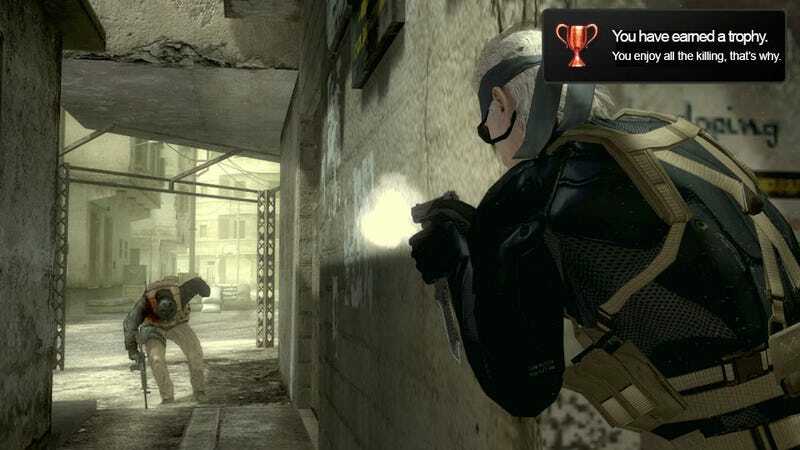 Bronze Emotion Control Controlled an enemy soldier's emotions using an Emotive Magazine. Bronze Hurt me more! Shocked an enemy soldier using Mk. II/III. Bronze Drum Can Addict Knocked an enemy soldier flying using a Drum Can. Bronze That Tune Is His Mind Control Music Played Oishii Two-han Seikatsu and made one of the BB Corps dance. Bronze Overhead view - just like old times… Used overhead view on Shadow Moses Island. Silver I Just Don't Fear Death Caused ALERT status while wearing the Corpse Camo. Silver Can you feel my power now!!!? Took control of an enemy soldier's body using the Mantis Doll or Sorrow Doll. Silver Are you an Otaku too? Viewed all model posters. Silver You're pretty good. Got kissed by Ocelot during the final battle. Gold Sounds of the Battlefield Obtained all iPod® tracks (excluding tracks obtained via password). Gold I am THE expert on weapons, equipment and cutting-edge technology. Obtained all weapons (excluding weapons obtained via password). I don't get down for PlayStation trophies nearly as much as I do for Xbox achievements, but even taking that into consideration, I'm sure I'm not the only one who is going to play through the game again and try to get all of these. Heck, I didn't even know some of this stuff was possible.